The beauty of many crystals stands out in their rough, natural state, while others lend themselves to be nurtured and shaped. The resulting pieces are more tactile and portray the inner beauty that was otherwise concealed. Here is our online range of Angels, Buddhas, Crystal Skulls, hearts and more,carved from a variety crystals. You can choose them for the healing properties of the crystal, or just by their good looks! Sculptures of the human skull have been carved in crystal throughout the history of man. Myths and theories have abounded as to their purpose and origin. Crystal skulls are carried as companions that enlighten a path of discovery, providing a fresh view as if seeing with the eyes of the skull. 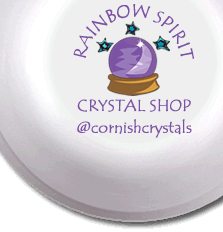 Rainbow Spirit Crystal and Cornish Minerals shop. We open the shop six days a week, so are online to answer any queries you have by email, or telephone 01208 816554 for friendly advice.